It was 1492 when Columbus sailed the sea to prove his theory that the world wasn’t flat but round instead. His discovery changed our perspective, opening us up to a 360-degree view of the world. Fast-forward to today when one could argue that we’re starting to venture on the same voyage with the way in which we capture our world through pictures and video. One of the many explorers proving that the world of video and photos no longer needs to be flat is Bublcam CEO and Founder Sean Ramsay. 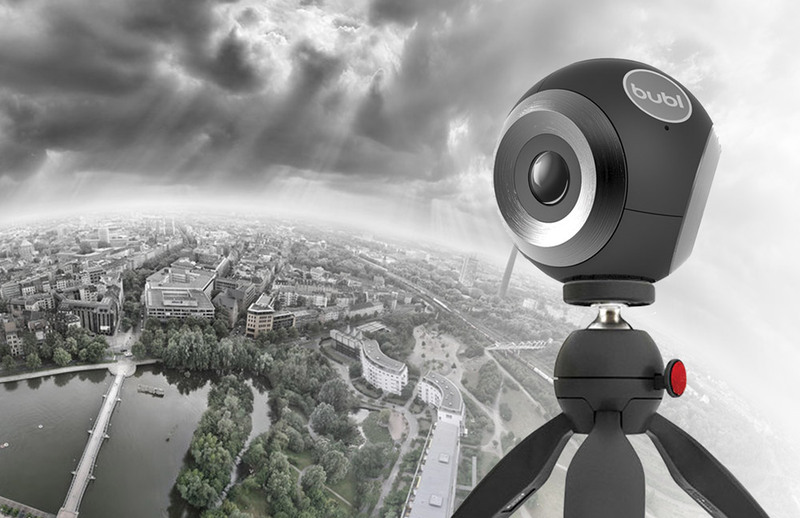 Bublcam is 360-degree camera that features a unique, patent pending tetrahedral design that overlaps its four cameras. It takes spherical videos and photos and live streams content with absolutely no blind spot. It packs all this in a device about the size of a baseball that can fit in the palm of your hand. We caught up with Ramsay at the CFC Media Lab ideaBOOST launch party where he took the stage to pitch the crowd as part of the graduating ceremonies. Ramsay presented Bublcam’s roll-out plan leading up to a full market launch in August of this year and additional feature enhancements for Bublcam V2 in Q1 of 2015. It was clear that out of all the companies coming out of the third ideaBOOST cohort, Bublcam was the furthest along. Ramsay’s pitch was polished and from the roadmap he shared with the crowd, it was clear that Bublcam is positioning itself to be a leader in the 360-degree video and photo capturing and streaming space. This shouldn’t’ come as a surprise. Bublcam killed it in Kickstarter at the end of last year when it raised over $346,000, beating an original goal of $100,000. We asked Ramsay if he and his team were prepared for the overwhelming success they saw from their crowdfunding campaign. “We were slightly prepared but I can definitely tell you that it went further than we expected,” he said. “We thought that we were going to sell maybe 300 cameras and we sold a 1,000”. One of the clear messages from Ramsay’s pitch was that Bublcam is not just a hardware company. In fact, a large part of Bublcam’s business offering is its live streaming and enterprise software solutions offered as a SaaS model which includes licensing access to an API and SDK. A focus on software brings Ramsay full circle (or 360-degrees pun intended). He started the Bublcam journey five years ago while working at Immersive Media who at the time were working with Google to create what we now know as street view. Ramsay told us that the only reason why he had to turn his attention to creating hardware was because there was no solution out there that was capable of what he set out to achieve. With the Bublcam device created, he and his team can now focus on offering solutions that use it. Bublcam is currently accepting offers from brands to utilize its software including MTV and AT&T. MTV will be using Bublcam to live stream the VMAs this year and they are working with AT&T to ensure that its network is ready for this new form of content. “Understanding how people want to use the technology is the hardest thing,” Ramsay told BetaKit. “There are so many different verticals that there is no way that we could keep up, which is why we offer the API and SDK, so if anyone else comes along and says that I need this for a live streaming application we either choose to work with them or provide them with the technology so that they can do this on their own”. Bublcam’s hardware and software could very well usher in a new era of entertainment, especially considering the growing demand in virtual reality. On the floor at the ideaBOOST event, the team was demoing Bublcam-created content in an Oculus Rift, where viewers watched video from every angle as if they were there at the time of taping. “We are one of the first companies that produces live action, real-world content with an Oculus,” said Ramsay. “Typically the content for the Oculus has been virtual but working with Oculus we know that this is not the end game for them and we are in a really great position to help them”. The virtual reality content creation opportunity is a huge one for Bublcam especially in light of Oculus’ recent purchase by Facebook for $2 billion dollars. For those excited to get Bublcam in your hands you will have to wait. Ramsay confirmed that shipments of the 360-camera to backers are delayed from the original May 2014 date but a new date has yet to be confirmed. The team is planning some exciting updates for 2015 including improved lenses, and sensor and cellular capabilities.